George W. McDaniel Receives 2014 South Carolina Environmental Awareness Award | Live Healthy S.C. The state of South Carolina awarded George W. McDaniel, Ph.D. as the winner of the prestigious 2014 South Carolina Environmental Awareness Award. McDaniel received the award during a ceremony on October 22, 2015. George W. McDaniel, Ph.D. (center) receives the 2014 South Carolina Environmental Awareness Award at a ceremony on October 22, 2015. McDaniel is the former executive director of Drayton Hall, a position he held for 26 years. 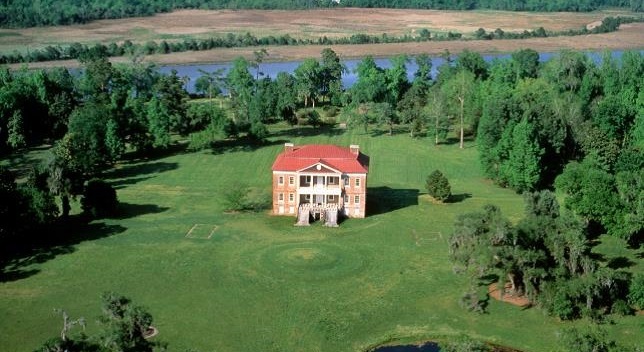 An 18th century plantation on the Ashley River, Drayton Hall is owned by the National Trust for Historic Preservation and managed by the Drayton Hall Preservation Trust. Drayton Hall with Ashley River in the background along with the uplands and march conserved by Drayton Hall. During his tenure as executive director, McDaniel created collaborative partnerships and led initiatives that positively influenced the integrity of the Ashley River region and ecosystem. He is now recognized as a local, state and national leader for his efforts in pioneering what is now referred to as “whole place preservation,” the combination of environmental conservation and historic preservation. Of his many achievements, McDaniel led efforts to have the Ashley River designated as a State Scenic River and is a founding member of the Ashley Scenic River Advisory Council. He has helped to conserve the tranquil natural environment and habitat surrounding not just Drayton Hall, but also around other historic sites along the river. He has raised awareness among thousands of people about the importance and interconnection of historic and environmental conservation through his speaking engagements, education initiatives, innovative tours of Drayton Hall, and published works. The S.C. Environmental Awareness Award was established by the S.C. General Assembly during the 1992 legislative session to recognize outstanding contributions made toward the protection, conservation, and improvement of South Carolina’s natural resources. Each year the public is invited to submit nominations that are then reviewed by an awards committee. In judging nominees, the committee considers excellence in innovation, leadership and accomplishments that influence positive changes affecting the natural environment. Members of the awards committee represent the S.C. Forestry Commission, S.C. Department of Natural Resources, S.C. Sea Grant Consortium and S.C. Department of Health and Environmental Control. This entry was posted in Environment and tagged Award, Drayton Hall, Environmental Awareness Award, McDaniel, stewardship, sustainabilitly on November 13, 2015 by SC DHEC.